Skylight Damage Repair in Southlake, Grapevine, and Richland Hills is only a call away! Southlake Roof Repair has Window and Skylight Specialists that repair and install specifically for our climate and weather. All our Skylight Replacements and New Installations are fitted with high Impact Glass, protecting from Hail Storms and anything else falling from the sky. Our Contractors are Experienced and Certified so your mind can be at ease. We make a point to always test our seals before a Skylight Installation is complete. 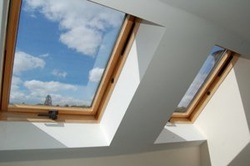 Not a single drop of water or bit or air will sneak in or leak out of our Beautiful Skylight jobs. If you are interested in installing New Skylights in an area of your home that does not have them, we can do that as well. Our Professional and knowledgeable Team will complete the work with the Highest most Efficiency. Our quality level of Products is at the Highest; we only offer the best to our customers. That goes for our service too. We thrive on Customer Satisfaction. Give Southlake Roof Repair a call if you are looking to have Skylight Repair or Installation in your home or business.